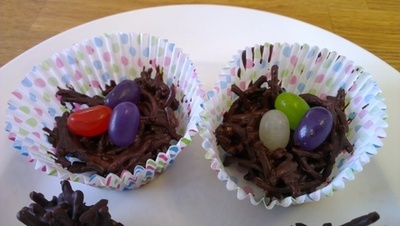 Chocolate birds nests were always a favourite treat growing up. They look beautiful but are deceptively simple and are an easy to make treat for even the youngest chef. 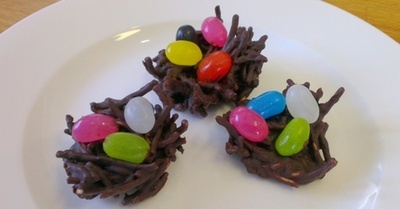 Chocolate Birds Nests make a festive addition to Easter lunch. You can use block chocolate or you can melt all the left over Easter chocolate to create a fun treat with your kids. 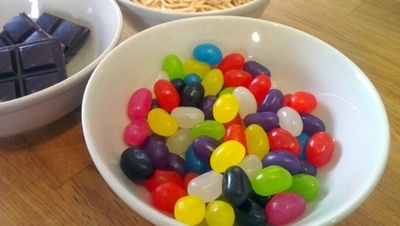 Bright and festive jellybeans- perfect for Easter! Line the muffin tin with cupcake cases. If you do not have a muffin tin you can use a baking tray lined with baking paper, however the muffin tin helps to make the birds nest shape. The cases make for easier cleanup. Roughly chop the chocolate and place into a large microwave safe bowl. Slowly heat the chocolate in the microwave until melted. 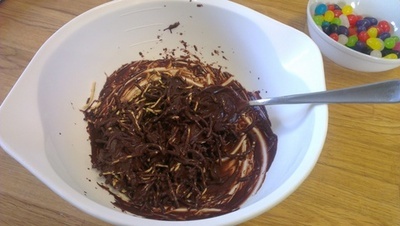 Add the fried noodles to the melted chocolate. Stir gently to coat the noodles without breaking them. Adults may need to assist the children with this step to ensure the noodles are fully coated. Spoon the noodle mixture into the muffin tin. Using the spoon (or your hands) gently make a small indentation in the center of the noodles. This will help hold the candy eggs in place. 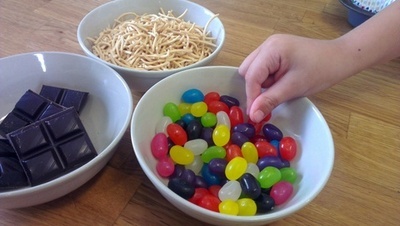 Place 3-4 jelly beans in the center of the noodles. 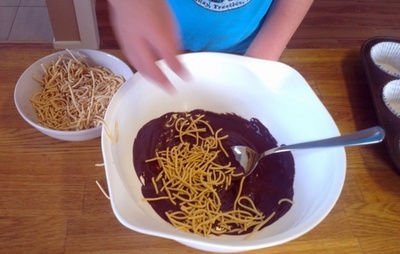 Ideally, your little helper can be doing this as you continue to spoon out the noodle mixture. 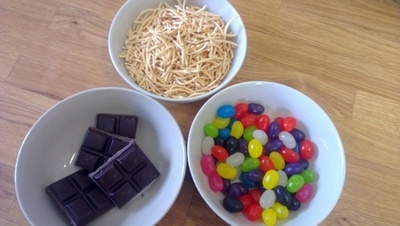 You want to place the eggs onto the noodels before the chocolate sets. 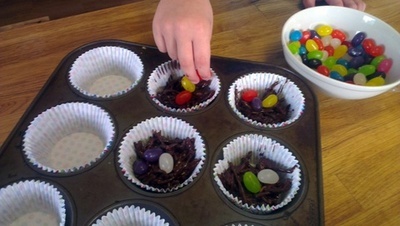 Place the muffin tin in a cool area of the kitchen or in the fridge to allow the chocolate to set. Once the chocolate has set you can serve the birds nests in the paper wrapper or remove the wrapper and arrange nests on a platter. The hardest part of this recipe is keeping enough jelly beans until the end!